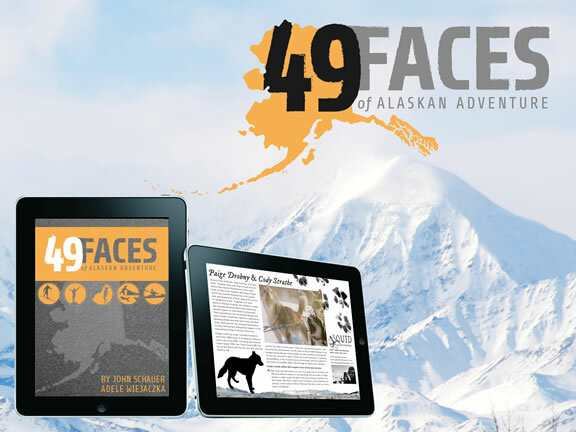 September 30, 2013, 8:09 am -- /EPR NETWORK/ -- Fairbanks residents and designers, John Schauer and Adele Wiejaczka, have launched a project to include 49 Alaskan Adventurers in a published iBook. The iBook will feature Alaskans whose lives are shaped by the wildest places in North America. Through this interactive and media-rich iBook, you will meet travelers of the arctic wilderness. Among the 49 Alaskans to be featured in the book are distance mushers Paige Drobny and Cody Strathe, class V whitewater paddlers Paul Schauer and Tim Johnson, ultra-distance specialists Tyler Johnson and Luc Mehl, alpinists Clint Helander and Jason Stuckey, and skier/mountaineer sisters Krista Heeringa and Heidi Rader. Launched on the Kickstarter platform, the 49 Faces of Alaskan Adventure is raising funds for it's publication at bit.ly/kick49faces. Supporters of the project receive unique rewards, such as the GPS coordinates to the "Great Alaskan River Party," a dinner and adventure in Northern Alaska, a copy of the finished iBook, and much more. Wiejaczka and Schauer, both Alaskan adventurers themselves, love wilderness travel and stories from the Alaskan backcountry. Wiejaczka owns her own graphic design business, Live Large Design (livelargedesign.com). Schauer works as a communications and professional development consultant and owns his own interactive media business, Think Far Beyond (thinkfarbeyond.com).